There are 14 reviews of L.12.12 Noir / Black. I agree with Russlan, that L.12.12 Noir seems to hearken back to classic men fougere scents, though not with as much of depth: Spicy, somewhat woodsy, fairly safe and subtle. The chocolate makes for an interesting addition as it plays off the cashmeran and patchouli, almost - uh - "melting" in their midst with its light presence. The basil and lavender are ever so subtle also, with the verbena being barely discernible. All in all, I find L.12.12 Noir to be too understated, a skin scent that I wish could be more intense than stated on the bottle. I tried all of the L.12.12 colors and I think Noir is one of the better ones. It's nothing impressive but it is quite unique in its own way. It's very fruity, sweet and the chocolate definitely gives its uniqueness. I can describe this fragrance as 'nice but not good'. It smells like L.12.12 Blanc without the citrus and freshness. I prefer Noir however, because I don't like citrusy and overly fresh fragrances (most of them give me headache). I currently also own L.12.12 Red, which I think is the best one. IMO Noir is the all-season version of the L.12.12 lineup, whereas the other colors tend to be more season bound (Red for fall/winter, Green, White, Blue and Yellow for spring/summer). Has a nice, fruity bubblegum opening that later settles down to a generic, clean smell. Also has something in it that reminds me of classic, old-school scents from the 90s. Projection is very good for the first couple of hours and then it becomes a skin scent for the remaining few hours that you can smell it. Like a slightly more grown up version of lacoste blanc..bursting with melon and fruit with a woodsy twist and a salty vibe ..I expected something rich and dark given the name Noir extreme and black bottle but it's anything but to me. More like a summer evening scent, moderate performance with half hour 1ft projection then a lovely skin scent 3 hrs ..I actually really like this as I used to enjoy the blanc version ..I don't see the point in owning both so I see this as a more progressive replacement..would be amazing if they did a parfume version in the future. Difficult to criticise except maybe for performance. A birthday present -- ouch, but bless them! Actually I have the 'Intense' version which isn't yet listed here. This is neither 'noir' or 'intense' though. I don't like any Lacoste fragrances -- they seem to mirror their rather tacky clothing -- all show but dubious quality -- a bit like Boss. This fragrance -- well it's a sort of 'generic guy' fruity, woody, sweetish one. However, like F by Ferragamo others seem to like it on me more than I do. It's not a bad fragrance per se and the smell isn't unpleasant -- it's also not a rasping, harsh, nose-tickler like others of this ilk. Very long smooth drydown elevates this one but I still haven't decided whether to wear in public yet -- I probably will. A fruity start - I get the melon impression with a drydown that turns floral and ends in a patchouli with leather. Not bad overall but very synthetic-generic and suite middle-of-the-road. The performace is nonetheless acceptable with side rate sillage, adequate projection and five hour of longevity. Versatile but on the dull side. 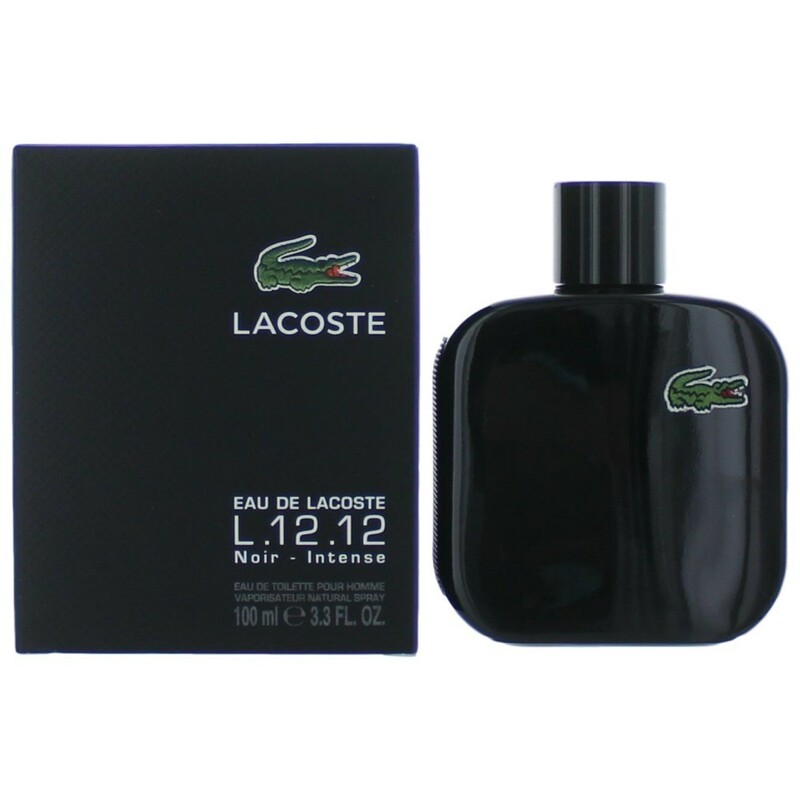 Lacoste Men's Eau de Lacoste Men's L.12.12 Black Eau de Toilette Spray, 3.3 oz. There are no member images of L.12.12 Noir / Black yet. Why not be the first?